Bhoomi Dani started her label to prove that Indian fashion can be a�?extremely plush and yetA� maintain a traditional design philosophy”. 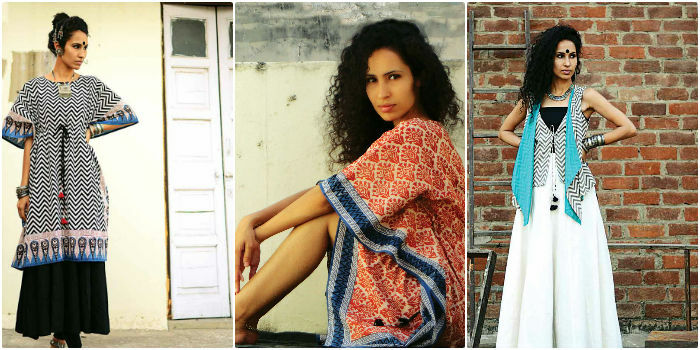 So, her clothes subtly merge native textiles with high-street trends. From summer jackets and palazzo pants to kaftans, scarves and foot wear, Dania��s creations are fun, quirky and very summer-friendly. The label marks its debut in the city with a showcase at Ilk Boutique that focuses on textile designers who offer urban apparel. Based in Gujarat, Dani takes her designs to local weavers and craftsmen and works with them to bring each piece to fruition. No machines are involved in the process and each unique garment is entirely made by hand. a�?Each garment carries elements of the culture from where it originates,a�? she shares, explaining that her inspirations are drawn from the music, traditions and myriad costumes of Gujarat. Woven cotton gets translated into jackets of varying lengths, poncho-style kurtas, tapered palazzo pants and flowy kaftan dresses as well as a range of brightly-hued scarves and stoles with off-beat prints. Reds, whites, blacks and blues dominate her current collection, while her prints turn geometric. Dania��s open, loosely structured styles encourage you to layer and mix things up as she caters to a�?the eccentric, diverse, candid and cheerful woman of todaya�?. Embellishments stay simple a�� subtle thread work that brings out the inherent beauty of each weave. a�?We are trying to reintroduce traditional Indian textiles and hand-crafted clothing by skilled artisans to suit urban, chic fashion that you can wear anytime and anywhere,a�? she concludes.